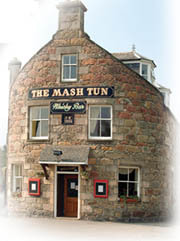 After completing an extensive 18 month renovation project, Mark and Karen Braidwood offer good food and accommodation in a family atmosphere, with a well stocked whisky bar at The Mash Tun in Aberlour. Since completing his training in nearby Elgin, Mark began his career in London as a pastry chef at Harrods. He remained in the city for many years, gaining experience under the guidance of reputable chefs such as Greg Brown of the London Capital Club, the exclusive private members club for business professionals, and Andy Turner who supplies the fine dining experience for corporate business entertainment. Mark also gained invaluable knowledge working at Brown’s Restaurant in Mayfair and finally at Silver Fleet, the celebrated dining cruising fleet on the River Thames, as operations Manager, where he controlled staff and events over a fleet of five sailing venues. Mark has catered for many celebrities including Sven-Goran Eriksson and Prince Philip. Four Luxury Rooms, The Glenfarclas, The Glenfiddich, The Macallan and The Glenlivet, and also a Luxury Suite – The Aberlour, ensure your overnight accommodation is enhanced with a whisky theme. Beautifully decorated throughout and named after local distilleries these rooms are all en-suite and have tea and coffee making facilities as well as television. A roll top bath enhances The Glenlivet Room, and all rooms enjoy spectacular views over the River Spey. The Macallan Room, which follows the curve of the building, looks towards Easter Elchies House – the original home of The Macallan Malt Whisky.